Keep educating yourself and never think you know everything. This is an always evolving industry. There are always new things, products, techniques etc. Always approach your business like a student. New to it; eager to learn, grow and adjust to changes. The worst thing you can do to yourself and your business is stay stagnant. 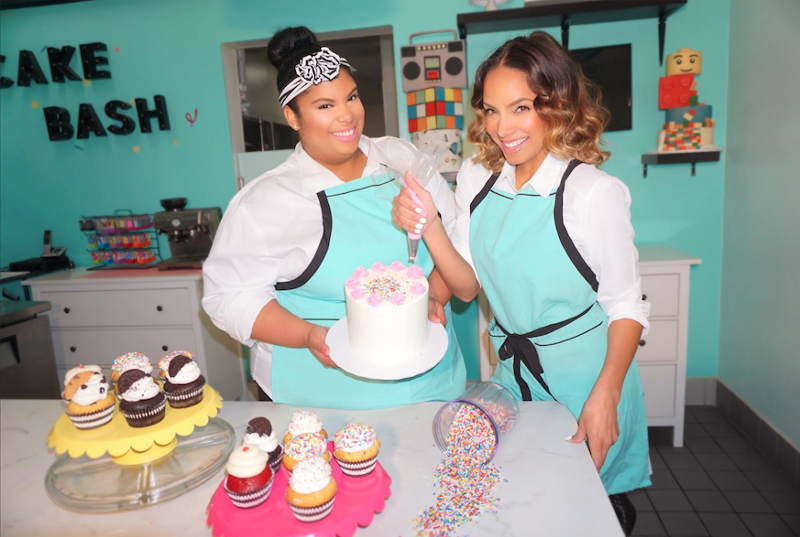 I had the pleasure of interviewing Miredys and Karla Peguero founders/owners of Cake Bash Studio & Bakery located in Van Nuys, California recently celebrated their first year in business. Looking back Chef Karla Peguero fell in love with baking at the tender age of 4. She remembers watching her mom bake delicious treats daily growing up and pouring so much love into creating all her birthday cakes, which brought her family and friends together. Currently, Chef Karla has a Youtube channel with over 120k subscribers and an Instagram page with over 11k followers watching her create. Miredys Peguero grew up a child star. Passionate about music, acting and writing she found herself signed to Mathew Knowles label Music World Entertainment and opened for Beyonce’s “The Experience Tour” in Monterrey, Mexico. She also recorded songs with LL Cool J, Foxy Brown, Lionel Richie and sang background for Toni Braxton after she caught legendary music producer David Foster’s attention. She landed campaigns with Pantene and was 1st runner up for Miss Puerto Rico Universe. Currently, Miredys is a mom of one and manages Cake Bash Studio with her sister Karla. Cake Bash Studio & Bakery is a one-stop shop able to create custom cakes for any occasion. There is an assortment of treats like cookies, cake pops and traditional Puerto Rican pastries available daily. Chef Karla always loved cooking and baking since she was a little girl. Having a bakery growing up that our parents owned really sparked Karla’s interest and made us see it as an actual business. We wanted to be together as a family, which was what got us to come together and start Cake Bash Studio & Bakery. We really do not measure our success, but if we had to it would be measured on the lack of fear of failing. We always go for what we want. We believe that we can do, create, and achieve anything we put our minds and hearts into. Success for us is the continuous hunger to make something happen that’s why we can say we are extremely successful and the best for us is yet to come. The toughest thing for Chef Karla was to find herself as a baker/decorator, her specific look, flavor and flare. As a business it was important to find our niche in an always, evolving industry. Also, not being from the states finding a middle ground where we could create things people knew but also have the freedom where we could introduce flavors, different treats and other concepts to our clients. We get our drive from each other for sure. We believe that if it was easy everybody around the world would be doing it. To live life your way, to call the shots, to live your dream you’ll have to be open and willing to walk that lonely road. Not everyone is willing but we are. It’s really a blessing for us sisters to work together cause at the end of the day we have each other to lean on, feed from and push on. We are always growing so the lows are needed as for the highs for the growth to continue. Having the correct attitude and mindset are crucial for success, so much in business as in life we see them as key to be able to achieve continuous success. Chef Karla: As a baker a funny mistake I made when I started was to take some elements lightly. Simple things as humidity, gravity etc. thinking I could make a sleek fondant cake in a humid place. For example, I thought the cake would stand tall without dowels etc. that’s was way back in Puerto Rico when I ended up finishing a cake in my car trunk but that’s a loooong story. From that I learned that I needed to take everything into consideration in baking and at times decorating everything comes down to science so even the little things can make or break your creation. We’ve been able to accomplish both great flavors and design. Most of our clients highlight that, specially mastering the process of achieving custom cakes with short notice. We also pride ourselves on great customer service, creating an easy process from request to delivery for our customers. We just had a customer come in on Saturday wanting a SpongeBob cake for later on the same day. We were able to deliver for him the same day fully designed with 3D fondant figurine topper cake in a matter of hours. His last minute request looked like a well thought out cake. Keep educating yourself and never think you know everything. Like I previously mentioned this is an always evolving industry. There’s always new things, products, techniques etc. Always approach your business like a student. New to it; eager to learn, grow and adjust to changes. The worst thing you can do to yourself and your business is stay stagnant. I would say a family friend named Thalia. She was the first person who told me to start making cakes as a business not just to have it as a hobby. She took me under her wing and showed me the first things I learned about cake decorating etc. I also would say my sister and partner Miredys. She really saw my talent, understood my vision and put together the business that Cake Bash Studio & Bakery is today. Starting from the Youtube channel to our front store I remember I was living in Puerto Rico and was missing my family and my only nephew. I was on the phone with Miredys and she told me well come here, move to Los Angeles and we’ll make it happen. I took a plane ticket and days of brainstorming. In LA I started looking for a job and after one job interview for a food styling job I mentioned to her that it was to work for a Youtuber and she told me YOU CAN DO THAT. Weeks later we were taping things for my Youtube channel. The rest is history! We are very open and welcoming. We know what it feels like to want something and not have a clue how to go about getting it. We are never shy to lend a hand, share knowledge, give advice to anyone. People contact us all the time; through social media, through our Youtube etc we are always there to assist them. We love to inspire and give back, it’s a blessing. Don’t be scared to reach out. You’ll be surprised how much help people are willing to give. Life is a network, collaborate. Everything moves and happens when people connect. Things are not meant to be done alone. I use to be scared to reach out to others doing great things in the industry. I once reached out to someone I look up to and never heard back so I won’t lie I got discouraged. I stopped for a while but then started reaching out to others on social media etc and from there I’ve been able to create a great network of amazingly talented females in the industry. Be open and flexible to doing things that are not necessarily in your comfort zone. Believe in yourself and your work. There’s always a client or an audience for your work. Don’t try to fit in. Sometimes I would not post things thinking that it wasn’t good enough. Finally, I did it then people would recreate them. One time a very successful pastry chef recreated my design. That showed me my work was not only good enough they also wanted to recreate it. Your uniqueness is what makes you; stay true to yourself. Don’t be so flexible that you end up losing yourself. You can’t please everybody, they are coming to you because obviously they like your work. What separates yourself from the next baker/cake decorator is that you bring yourself to the equation. There can be 5 different designers creating the same design. They will all be different if they bring themselves to the design and just not try to emulate the design. Have fun. Everything flows and grows when you’re having fun. It can be just another day at work or it can be another amazing day to create and live out your dream. You choose. I would like to start a movement where we encourage everybody to just get in the kitchen. You’ve heard people say the best times happen around the kitchen table and I so believe that. Spending time there growing up got me to this path. I believe it expands your artistry, your understanding and knowledge of entrepreneurship and can even become the place to be, explore and find yourself. I know this industry is not often viewed as a career but look where it took me! It’s amazing what it can spark.